Network Time Protocol | CCIE or Null! Like all technologies in a network there are ways to secure it from being used maliciously, and NTP is no acception. We actually have a few different ways to secure the communication between our NTP peers and servers. NTP authentication on the NTP master. 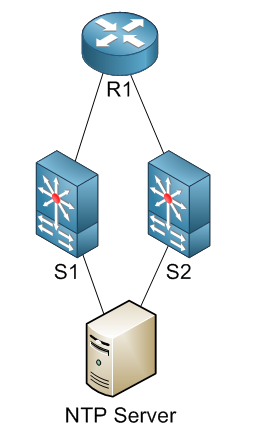 Do keep in mind, I’ve built this configuration off my previous NTP lab post so not every NTP command is shown above. NTP debug with wrong key on the master. From there you can see we transmitted a packet to 172.31.1.1 (our NTP master) with authentication key 1, however the packet we received from 172.31.1.1 had an authentication key 0 (No authentication). So once I saw that I quickly realized where my problem was. I went back to the NTP master and issued the command ntp trusted-key 1 and then went back to client check the ntp status. 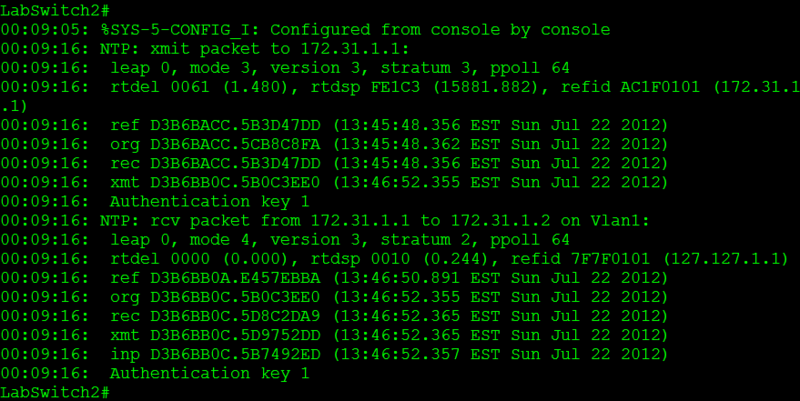 After reviewing the debug output again, both packets are using an NTP authentication key. Keep in mind the NTP key # does not have to match but the MD5 password within the keys has to match. Peer: Peer access-groups allow both request and control queries to be processed meaning the router will be allowed to update its time from the allowed peers. Query-only: This only allows control queries to be accepted, control queries don’t actually the effect the date/time so I’m going to skip this one. See RFC 1305 for addition information about this. Serve: Allows the router to reply to request as well as control queries. Serve-only: Does not allow control queries and only replies to NTP requests. So from our example our NTP master is setup to serve-only our NTP clients, and our NTP master has full access to our NTP clients. 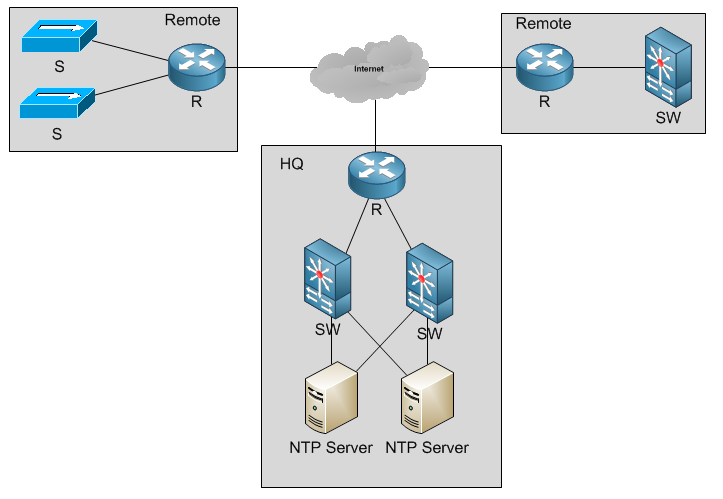 One last thing I want to touch on concerning NTP access-groups is the fact if your setup an ACL between 2 NTP servers, you must remember to allow the local NTP server address, in this case it is 127.127.1.1 this address might different depending on the router model and IOS version so it’s always a good idea to check it out. It’s not overly complex but it can be a little time consuming and it can cost you a good amount of time depending on the type of issue you are troubleshooting. In my mind this is completely unnecessary and should just be corrected. How do we correct this though? Well we configure our devices to check in with a time server and get the correct time using NTP (Network Time Protocol). From here we configured a timezone for our router, I named the timezone EST I figured I’d keep it simple and set it to -5 which is where the Eastern time zone fits in the world. Then I set daylight saving time with the clock summer-time EST recurring command. After that I start configuring some NTP parameters I start by turning on NTP logging, I did this just for the sake of showing off some of the NTP logging messages. Then I configure the router to update it’s hardware clock with the time it receives from the server with the command ntp update-calendar, the hardware clock runs off an internal battery and will keep the correct time even when the router loses power. Now we configure our router to check in with ntp.you.org this is just one of the stratum 1 servers I pulled off the webpage mentioned earlier. The messages are simply telling us the clock was reset, and synchronized successfully with the server we configured. We can verify this by looking at the sh ntp status & sh ntp associations output. You can see from the sh ntp status output, that our time is synchronized, our stratum level is 2, and when the last update was. From the sh ntp associations we can see we are peered with the NTP server 204.9.54.119 (Confirmed with the * before the IP address) and the NTP server we are peering with is using a CDMA device for it’s clock source. Also notice the 127.127.1.1 address, which is the local router. 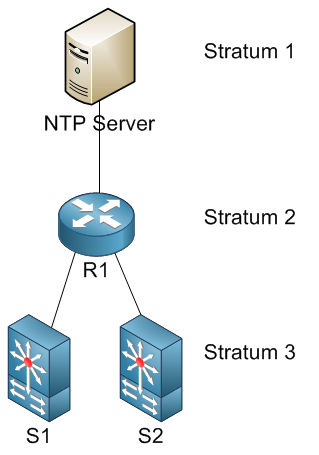 Next we going to setup our router to be an NTP master for other network devices in our network, and we are going to give our router a stratum level of 2, see the below config. We can can configure this router with any stratum level we want but it’s usually best to configure the stratum level to match it’s real stratum level. 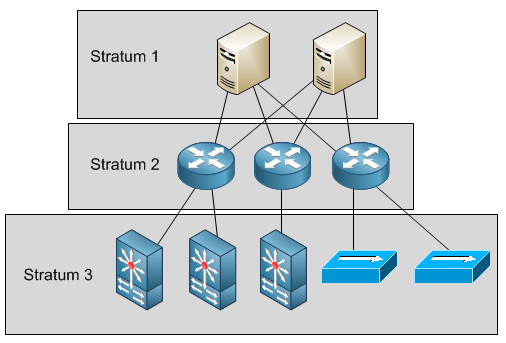 A router with a lower stratum will override the time of router configured with a higher stratum level so its best to configure appropriate stratum levels. Notice there is less information, but it still tells us what we need to know. We see our clock is synchronized and to whom, as well as our stratum level. Our stratum level here is 3, since we got our time from a stratum 2 source and we are one more “time hop” away from the stratum 1 source.